This has changed the game as far as budget cubes. There have beed decent ones for some time but this is a contender to be one of the best cubes on the market. I do get a bit of catches on it and magnets do help with it for sure. It is a very similar design to the MoYu TangLong but with a bit of a cheaper feeling to it. 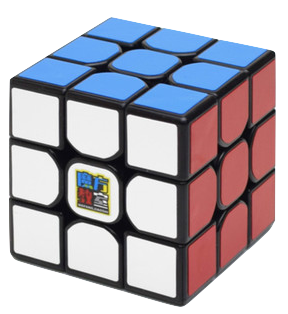 MF3RS is one of the cheapest cubes on the market currently ranging from around $3-7. It comes in black, white, stickerless bright and stickerless pink. I have the stickered black version. Out of the box it was amazing. It was able to corner cut 45 degrees. It has a really scratchy and crunchy feel. It is fast but at the same time controllable, which is a trait the tanglong had as well. After setting up my ones can cut a little over 45, about a piece reverse, and they are controllable to compensate for my turning style. Overall I would definetly reccomend the MF3RS, to anyone of any skill level. It is one of the best budget cubes on the market, and not "the best". Any beginner can shave off seconds from their previous timings if they hand not used a professional cube before. I get decent times with it, but it can't out perform cubes like gans,weilong and valk. But it out performs a aolong v1, hualong, yuxin, guanlong in corner twist, stability, weird pops, smoothness respectively. Out of the box it is very dry and scratchy but fast. After having 100 solves and setting it up and loosening it, it feels very nice and I can get nice time on it. Although it is cheap, it does not have a hollow feeling. I do recommend this to anyone. I got this cube at around the start of January, and even out of the box the overall performance was outstanding. It feels extremely smooth and has an overall light and speedy feel to it!